Couple of part numbers for 1st gen front fender fasteners. The Auveco part number for the shiny, 1/4 turn fasteners that hold the front fender and liner together is 19315. 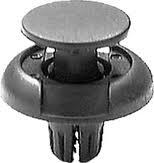 This is the Philips head fastener that can be seen just inside the wheel wells. Instead of buying a box of threaded fasteners for the inner splash shields next to the engine, I bought item 19118, a simple push-pull fastener that has two notches 180 degrees apart. This way, instead of messing with a threaded fastener that might have dirt or sand in the threads, you can just use a tool to grab at the notches. Fastenal sells them locally. I pick them up all the time. much cheaper than the stealership too. I refuse to get these from the stealership, and I snapped a couple by accident the last time I pulled my bumper off. @ Flip and Ti, Fastenal? Never heard of it/them. Thanks Ti - too bad they make you buy 15 in a package, I only need 3 lol. I'll probably just end up sharing them with the other NE guys. Parts stores have these in baggies, all types and sizes for cheap. No way I'd pay dealership prices for a fancy fastener. Do u know if these fasteners shown in the first post also fit the 2nd Gen 6? yes the do. it is a industry standard used on several platforms. as for buying 20/box at fastenal....... my car is apart enough that I break them on a regular basis. All it takes is me stepping on one. my car is apart enough that I break them on a regular basis. All it takes is me stepping on one. Haha that's how I broke two of mine. The other one was exactly what Karlt was talking about, how if they get dirty at all then they just spin and you can't get them out. So I took a flathead to the 3rd one that broke lol.